I can’t believe it’s already half-way through my mini art marathon, and thus January! In fact, my birthday is in about a week on the 22nd, and it completely snuck up on me! I don’t really have any plans for my birthday, so maybe you can offer me some suggestions. Any ideas? The paintings above were an exploration of more minimalism in my painting. Color is an extremely important aspect to my art, so I wanted to play around with it a bit as well. It was fun to loosen up and just explore the textures, blending, and composition. I love how the colors turned out in these. I was going to add more detail to the cups, but I liked how the colors poked through so I stopped myself. They are prettier in person, but unfortunately you can’t see that unless you buy them! 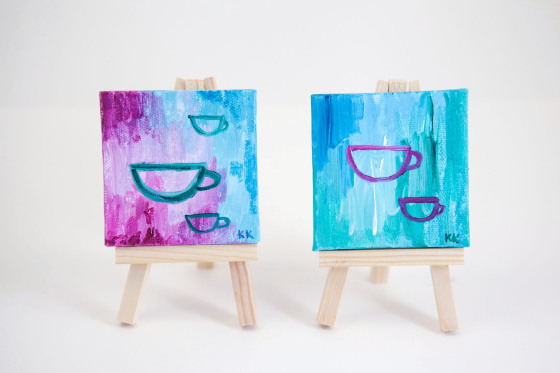 They would make a fun gift for a coffee or tea lover, no?